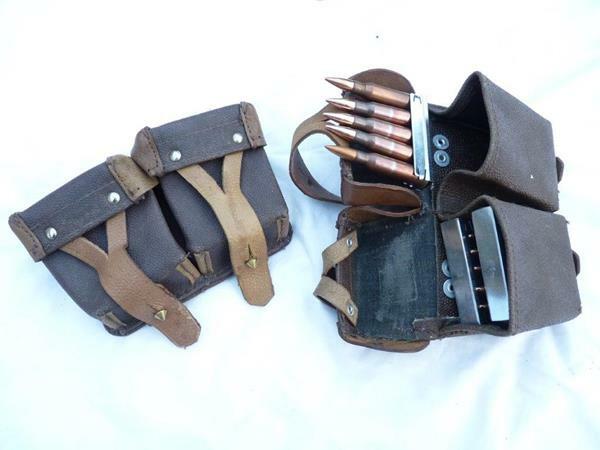 This is an ammunition pouch as used with the Mosin-Nagant rifles and carbines, made of leather and a synthetic material. They can fit on the sling, or equally a belt or strap, being of similar design to the German K98 ammo pouch. They hold 15 rounds comfortably in each pouch making a total or 30. Although they are very light, new Royal Mail pricing structure makes these £5 to send by recorded post, sorry! Our Price: £8.00 each, rounds not included!